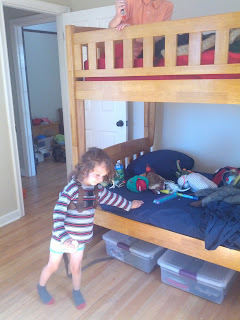 I finally got fed up with the disastrous mess that was the boys room. Because their closet is just an empty space - no shelves or drawers or bars to hang anything on - their clothes were being not-so-neatly stacked on the shelf that had been where toys were kept, so toys were just strewn around the room as they took them out of boxes. We've invited a kid in Gareth's grade over after school on Monday, so that was an excellent motivator in getting the room somewhat organized. I'd purchased some under-bed storage containers a couple weeks ago, thinking they'd be good for putting out of season clothes in. Since we haven't figured out what to do with their closet yet, I used those today to put all of their clothes in. This emptied the bookshelf to use for toys. We still have one box of things to sort out. 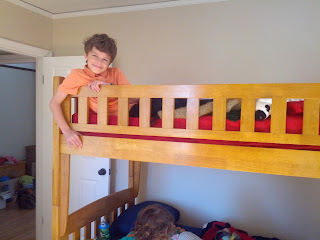 Plus I want to get some curtain rods and hang the book bags we had in the rental next to the bunk bed, 3 for each of them to store books/kindle/little trinkets. 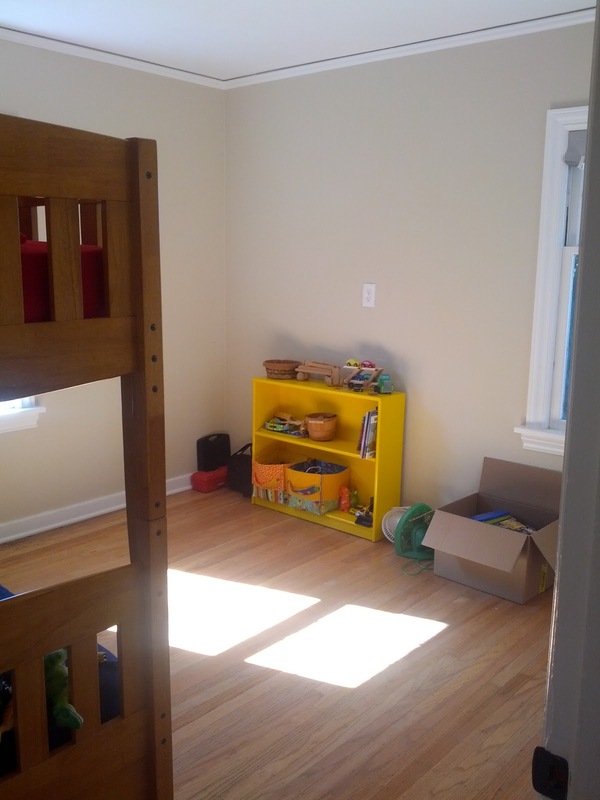 But at least the floor space isn't entirely covered in clothes and toys anymore. Looking in from the doorway. 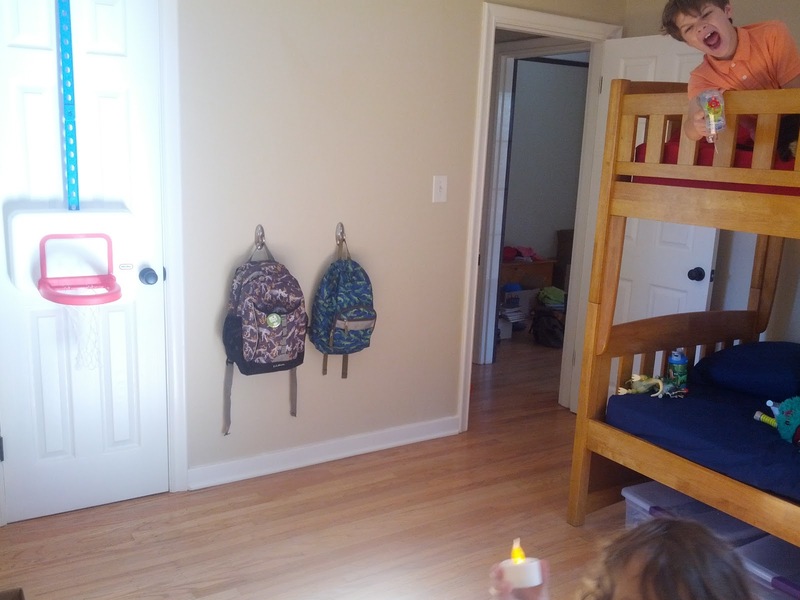 The only outlet in the room is the one above the toy shelf there. We plan to add at least a couple more outlets. They've got two windows, both of which could probably do with being replaced eventually. I added command strip hooks on the wall to hang backpacks/lunchboxes. 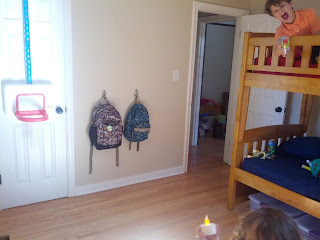 I hate having those lying around all over the house, so now Gareth's job when he comes home is to immediately empty his lunch box and backpack and then hang them up. Mal really likes his fake fire, and insisted it be in a picture, so do note it at the bottom of the frame there. The basketball thing is hanging on the closet door. The closet is currently home to their hamper, shoes, and a few toys. We still have work to be done gradually. The door scrapes on the floor when it gets about halfway closed, so we need to figure that out. And the windows and closet as already mentioned. We haven't hung anything on the walls yet and I'd like to paint the room. An area rug for the floor might also be in the cards since to little kids walking = stomping. 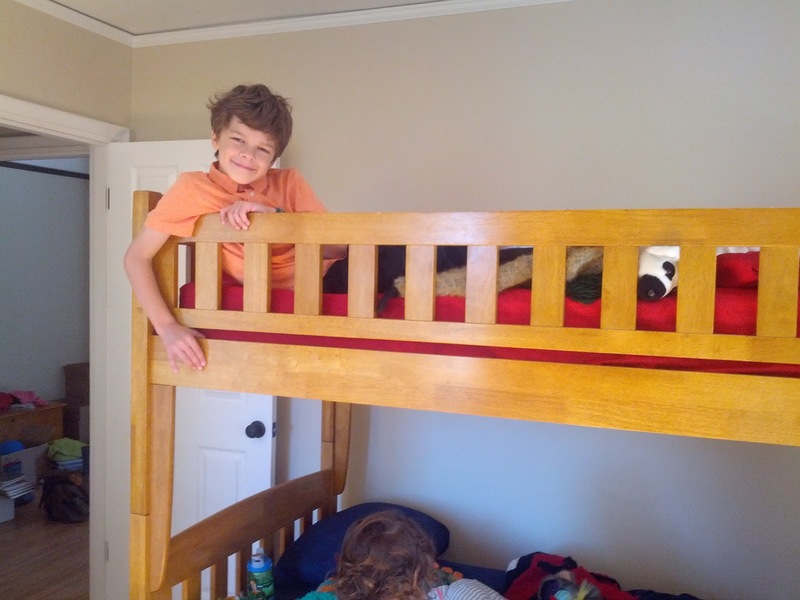 It frequently sounds like we've got a herd of elephants, not children, in the house.